Backed by big thinking and field-proven quality, Butler Creek develops some of the world's most innovative hunting and shooting equipment on the market. From the world-famous Flip-Open scope covers to smarter ways to carry gear and outfit guns, Butler Creek provides hunters with the best in comfort and convenience. Designed with the simple goal of making life easier for the user, Butler Creek is trusted by sportsmen everywhere. 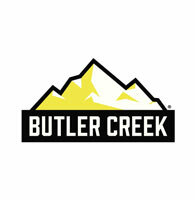 For more information about Butler Creek products visit www.butlercreek.com.